I’ve got to admit that our whole family are carnivores . . . . we do enjoy our meat . . . .
. . . .but smoked pork ribs has got to be one of our all time favorites. I can’t even imagine how many slabs of pork ribs we’ve gone through . . . . or how many chunks of hickory wood we’ve used. . . .
. . . . or the hours my Honey spent out in the woods searching for a hickory tree. Like a mushroom hunter he had his favorite places . . . . kept secret, of course . . . . from other hickory seeking carnivores. 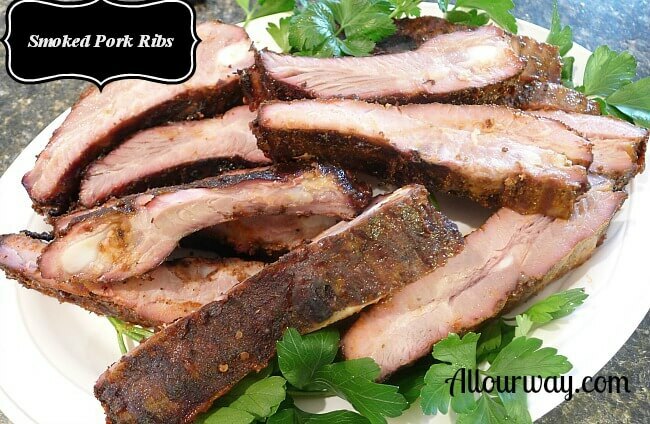 Pitmasters keep their recipes for making the perfect smoked pork ribs a guarded secret . . . .
. . . . there is a lot of money to be made for the perfect rub . . . . the perfect sauce . . . .
. . . . and the perfect way to put it all together for a succulent . . . .juicy . . . .slab of pork ribs with just the right amount of resilience and chew. The meat should not fall off the bone. Pork ribs that fall off the bone are ones that usually have been steamed or boiled. 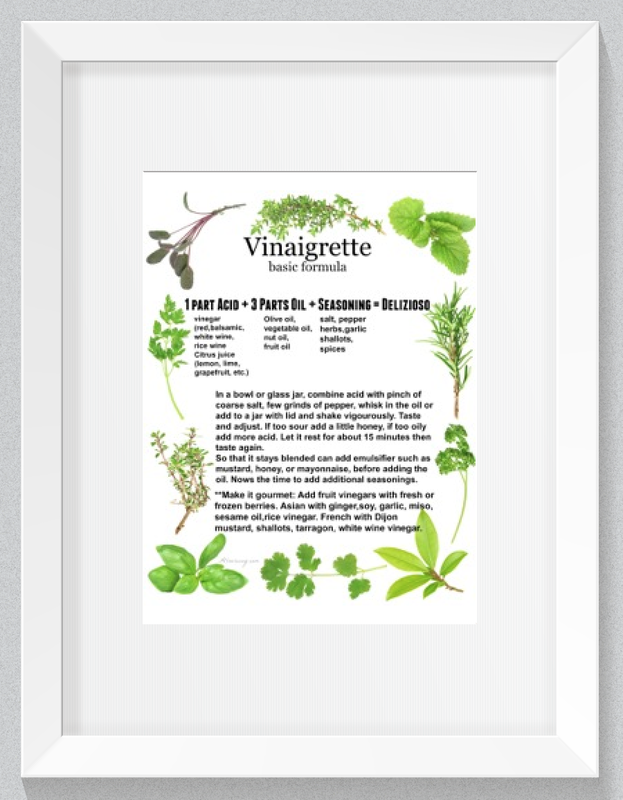 Using a process like that robs the pork ribs of flavor because water can dilute the flavor. 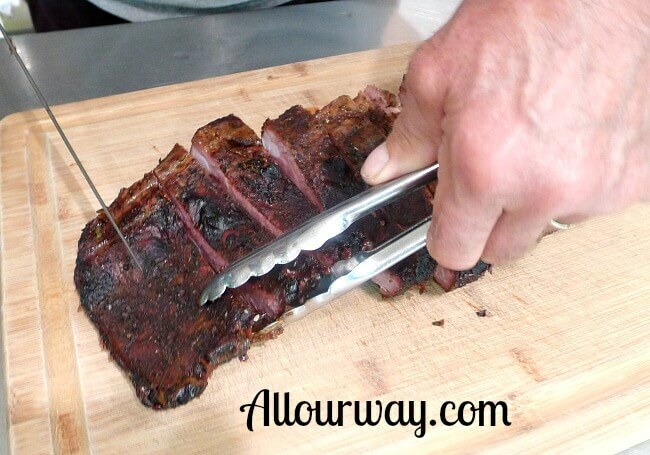 Properly cooked ribs will pull cleanly off the bone with your teeth. Mr. Meathead at his website Amazing Ribs writes countless pages on the science of barbecue . . . .everything from starting the fire to the thermodynamics of what happens when heat hits the meat. Most of Mr. Meathead’s advice is something we’ve been doing for years . 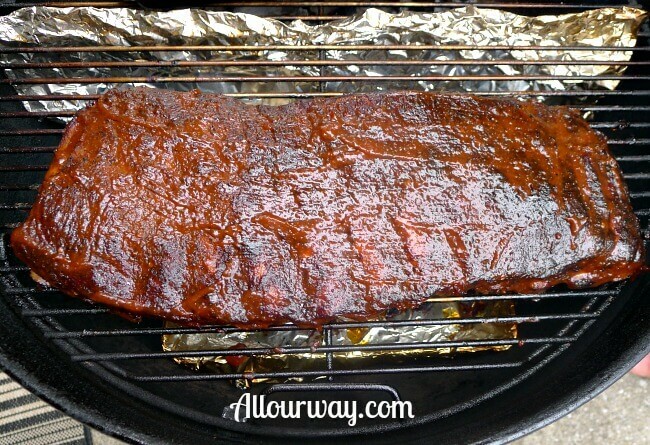 . . .I think my Honey could make smoked pork ribs in his sleep. When we are ready to smoke pork ribs . . . . my hubby first prepares the meat by tearing off the membrane on the bony side of the pork ribs. Once that’s done he liberally sprinkles both sides of the pork ribs with . . . .
. . . All Our Way Seasoning and Rub. My hubby prepares the charcoal for the grill and the method he will use is for indirect heat like he did for the pulled pork. The temperature of the grill is 225 F to 250 F. This is an ideal temp . . . . it is hot enough to brown the surface, to develop a crusty bark . . . . and to melt the fat and collagens. Throughout the grill process my hubby always makes sure to maintain a temp of 225 F. . . . and the pork ribs stay in the same position as when he put them on . . . . with the meat side facing up. 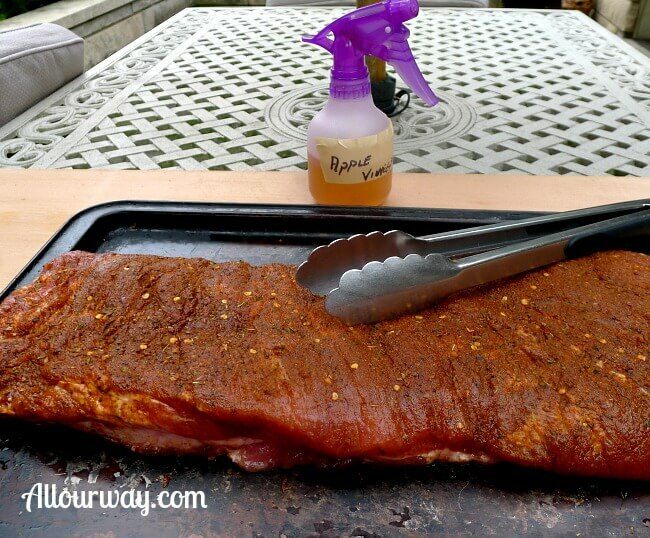 When the ribs are nearing completion . . . . about one hour . . . . he begins to slather our special Spicy Bourbon Barbecue Sauce on the meat side. These ribs took six hours to smoke so on the fifth hour he began to baste. He usually paints the sauce on the ribs two times. Prior to basting the ribs with the sauce . . . . he occasionally spritzed the pork ribs with apple cider vinegar. 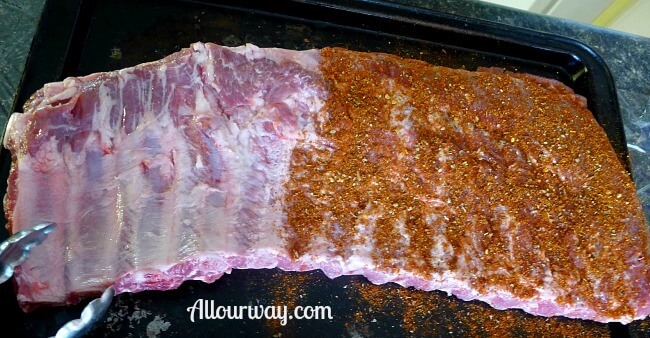 There are several ways to test if the ribs are done . . . . my Honey uses the bend test. He picks up the ribs with a pair on tongs and he bounces them slightly . . . if they are ready . . . .
. . . . the pork ribs will bow until the meat starts to crack on the surface and be close to breaking when you lift them. A rule of thumb is that at 225 F baby back will take three to four hours to cook and about five to six hours for a slab of St. Louis cut ribs . . . . which is what we have here. The scent of these pork ribs are sweet and fragrant and the meat is perfect . . . .it’s tender but it still has some resistance. There’s an excellent combination of texture . . . .aroma . . . .flavor . . .without any one being dominant. 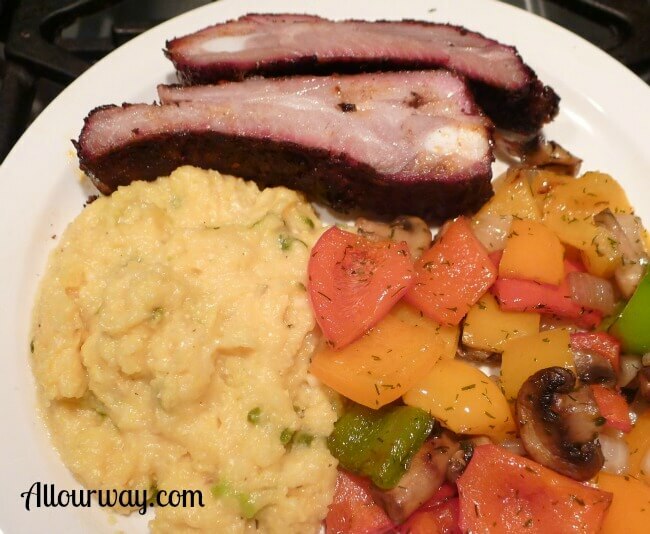 We decided to add Grilled Peppers and Mushrooms with the pork ribs and we agreed that the meal wouldn’t be complete unless we included Cheese Grits and this time we included grilled jalapeno peppers. Thank you for hosting! It is an honor to be among so many talented bloggers.